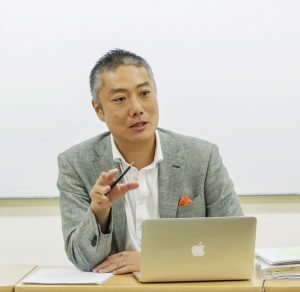 Tatsuya YAMAMOTO is a Professor at Seisen University (Japan). He is also a member of the strategic forum for human futures at the Engineering Academy of Japan and a member of the board of directors of Mottainai Society (it is regarded as a Japanese branch of ASPO: Association for the Study of Peak Oil and Gas). He was born in 1975. He holds a Ph.D. in media and governance from the Keio University Graduate School of Media and Governance. He assumed his current position after serving as a director and visiting research fellow at the Japan Center for Academic Cooperation of the University of Aleppo in Syria, among other positions. He received a Sylff scholarship in 2001 during his studies at the Keio University Shonan Fujisawa Campus. While conducting research abroad at the University of Aleppo in Syria, participated in the Sylff Africa/Europe Regional Forum held in September 2003 at the American University in Cairo. In 2007, attended Building a Better Asia (BABA): Future Leaders’ Dialogue, a retreat for young Asian leaders organized by the Nippon Foundation and held at Peking University, as a Sylff fellow. He specializes in international relations, information society, and public policy. He is currently carrying out research on “Peak Oil” issues, particularly its impact on Globalization. He is also interested in policies related to local community building in the era of Post-Easy oil. He is an author of Revolution and Turmoil in Egypt: The Politics of Social Media and Peak Oil (Keio University Press, 2014), Information Control in the Arab Countries: The Politics of Internet Control (Keio University Press, 2008), and a coauthor of The High Walls of the Internet: A New Clash of Cultures and Border Disputes (coauthor, NTT Publishing, 2009), How to Look at Politics (coauthor, Yachiyo Shuppan, 2010), along with other publications. He received his BA in policy management, MA in media and governance, and Ph.D. in media and governance from Keio University (Japan). Please feel free to contact him via E-mail. He can be contacted on yamamoto [at] seisen-u [dot] ac [dot] jp. ©Copyright2019 Tatsuya Yamamoto Website.All Rights Reserved.